Yesterday saw the 2015 China (Songshan Lake) Biotech Industry Investment and Financing Development Forum held in Songshan Lake. It s understood that Dongguan City Biotech Industry Development Co., Ltd. ( Dongguan Biotech ) will form a strategic alliance with DAAN Gene Co., Ltd. of Sun Yat-sen University and Guangdong Venture Capital and Private Equity Association to advance the development of Dongguan Cross-Straits Biotech Industry Cooperation Base. 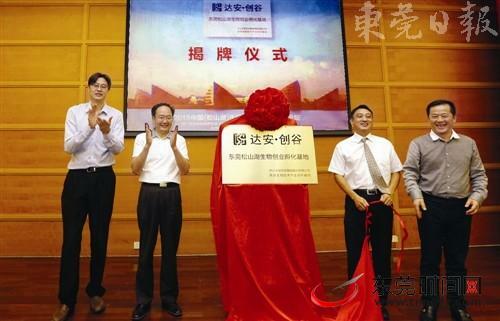 It s further understood that DAAN Gene will establish a bio-medicine incubator named Creative Valley Dongguan Songshan Lake Bio-creative Incubation Base in Songshan Lake. The Incubation Base was officially unveiled at the Forum yesterday. Dongguan Biotech is a solely state-owned enterprise responsible for the development, construction and comprehensive operation of the Cross-Straits Biotech Industry Cooperation Base. According to an official of Dongguan Biotech, this strategic alliance with DAAN Gene and Guangdong Venture Capital and Private Equity Association is because of the rich bio-industry resources in the Pearl River Delta and in China at large. Listed on the stock market in 2004, DAAN Gene has been committed to building the whole industry chain of medical health integrating research and development, production, sales service and medical terminal on the basis of the strong research platform of Sun Yat-Sen University. As China s largest gene diagnostic reagent, DAAN Gene ranks the 1st in the industry in terms of new product applications and registrations and stands as the industry s sole enterprise with a national direct selling platform. According to a director from the Base, the three parties will realize resource sharing and complementarity through bio-incubation base, bioindustry fund and specialized bio-enterprise industrialization service platform. The ultimate goal is to provide bio-enterprises in the Base with multi-level and all-round integrated services from research and development, registration, production, capital and sales terminal to business management and capital operation. A director from DAAN Gene revealed that DAAN Gene would rely on its advantageous resources to promote the entry of quality biological projects in the Base, support the expansion of these quality biological projects and accelerate the development of the Base. In addition to the three-party alliance, DAAN Gene will further build a bio-pharmaceuticals incubator in Songshan Lake. Its superior resources will be used to draw quality startup projects to the incubator, and specialized services provided subsequently to these projects to support their expansion and ultimate entry into the capital market. By far, Songshan Lake (Biopark) has gathered 140 biotech enterprises through the Base. According to Song Tao, adviser to Dongguan Municipal People s Government and chairman of Dongguan Biotech, the bio-pharmaceutical industry of Songshan Lake (Biopark) will embrace a rapid development stage with the three-party alliance, and expectedly become the largest industry of Songshan Lake (Biopark) in the future. Now joined by 140 biotech enterprises, Songshan Lake (Biopark) is faced with development bottlenecks in that these enterprises are generally short of funds. An industry insider pointed out that restraints like huge investment, long R&D cycle and slow industrialization of the bio-pharmaceutical industry, lack of good investment ideas and environment in China in comparison to the marketized foreign venture investments have made certain innovative R&D bio-pharmaceuticals enterprises impossible to tide over the Death Valley. Debuting at the Forum yesterday were 6 enterprises, including Ranger Analyticals and Baihui Biotech. Persons in charge from these enterprises presented the project road shows. After preliminary communication and exchange between the investors and project managers at the Forum, these road show projects won good comments from the investors. We have invited a number of investors to the Forum to exchange with enterprises with financing demands. On the one hand, the investors can provide development funds for quality projects; on the other hand, the enterprises can learn about the investment and financing market and prepare for subsequent financing, Song Tao said at the Forum. According to a director from Dongguan Biotech, Songshan Lake (Biopark) will introduce more venture capital investment organizations and industry funds, rely on the capital from all sources to facilitate the rapid development of the biotech industry, and improve the industry chain and sustainable development mechanism by helping R&D enterprises tide over the Death Valley.